Post your thoughts about bilingual signs on highways. I think that roads nearing the border into Quebec should be signed bilingually. Quebec has a dominant french speaking population. People crossing the border from there and don't know English would not have a clue on what some of the signs would be saying. Speed limits being signed bilingually (MPH and km/h) would probably be wise too. I'd apply the same thing on the Mexican border, specifically in San Diego and Brownsville. Many people cross the border at I-5's southern terminus. Brownsville is growing, and with I-69 going to terminate there, I'd expect many people crossing the border. Where it'd be needed a lot is in Iqaluit, NU. A very large Inuktitut speaking population lives there. English signs are a standard, in my opinion, so Inuktitut-English signs would be helpful there. Many major roads near the Canadian border ARE at least in both metric and english (including all of New Hampshire), with some bilingual signage in places such as northern Maine. And I-19 in Arizona is being converted from metric right now, so I don't foresee any roads in the U.S. being converted TO metric at this point, much less being posted bilingually. NYSDOT once experimented with metric-based exit distances in Syracuse of all places. EDIT: And I just realized that the exit tab isn't right-justified. Near Quebec in New York, there are numerous signs that are both in French and English. I disagree. Borders form great bright lines. I have driven in Quebec, Puerto Rico, and Mexico and had no problem. Its place names, numbers and cardinal directions. (And PR, BTW, has a unique relationship with the metric system, US spec cars, metric distances, US speed limits). Other than simple signage at the border reminding people of the system, if you want to drive in a place, you need to cope. Mexico is filled with English signs. Gotta attract the "oblivious Americans with fat wallets" demographic! I disagree. Borders form great bright lines. In the Western Hemisphere, yes--not so in other parts of the world where there are transnational customs unions (e.g. the Schengen zone in western Europe). I have driven in Quebec, Puerto Rico, and Mexico and had no problem. It's place names, numbers and cardinal directions. I would say that, in general, it is not that common for bilingual highway signing to be provided primarily to overcome a genuine language comprehension problem, and when it does occur, a different alphabet and sometimes even a completely different writing system is involved. Examples of this include Israel (trilingual Hebrew/Arabic/English in major tourist areas, Hebrew/Arabic in other areas not heavily frequented by tourists), most of Asia with syllable-based writing systems (China, Japan, Korea, etc.). The more common approach to accommodating multiple languages is to define language areas which are then signed monolingually, with bilingual signing--if it is provided at all--generally confined to contact territory (where a substantial proportion of people can speak both languages) and to roads or facilities which serve high proportions of nonlocal users speaking different languages. The classic cases in point are Switzerland, where bilingual French/German direction signing is limited to areas where French- and German-speaking Switzerland border on each other, and Spain, where regulations require transport terminals (airports, ports, railway stations, etc.) to have signing at minimum in Castilian Spanish, with the option to use other languages such as Basque, Catalan, etc. where they are allowed or required by the language statutes of the relevant autonomous community. There is still an economic argument in favor of providing bilingual signing at transport terminals where this will allow more efficient processing of people who would otherwise be stuck trying to interpret monolingual signs. Ever tried going through Narita airport with kanji only? But in general I don't foresee expanded provision of bilingual signing in the US beyond a 50- to 100-mile zone north of the border with Mexico (contact territory with Spanish), a 50- to 100-mile zone south of the border with Québec (contact territory with French), and other-language districts in large cities like the various instances of Chinatown in San Francisco, Boston, etc. Put simply, bilingual signing in the US is a solution in search of a problem. Language activism in the US is tilted quite in the opposite direction, i.e. toward English-first or "English as official language" policies, because the various immigrant communities have internalized the message that they can't assimilate and become "real Americans" unless they learn English. The live question for those communities is whether they should suppress their own native languages in order to prevent them from interfering with learning English. This problem is now faced by Mexican immigrants in the US, but in the past it confronted second-generation German immigrants who were born in the US, grew up speaking both English and German, but felt that their children wouldn't have a chance to get ahead in life if they were constantly confusing "let" with "leave" and making other grammatical mistakes in English which are characteristic of native German speakers. In the US, also, we operate under a highly restrictive theory of sign reading. Our signing system, including the three-destinations limit and letter height criteria given in the MUTCD, is founded upon the assumption that the driver must be able to read the entirety of a sign twice in the time that it is visible. Other jurisdictions rely on a different theory which assumes just that the sign has to be laid out in a way which allows each driver to pick out the information that is strictly relevant to himself or herself--hence the existence, in Britain, of map-type diagrammatic signs which may have as many as six arms, with one destination on each. Bilingual signs are just a convenient "bolt-on" under these systems since research has shown that the time required to pick out the relevant information increases, but not by much, provided that the driver's native language is shown first in bilingual legend pairs. In principle US traffic engineers could switch to this approach, but that would mean giving up the whole-sign-must-be-read-twice assumption, which is tried and true (almost 70 years old) and yields very conservative design results. That is a very tough sell to make in such a safety-critical area. It is also the reason why research, in the US, on accommodating speakers of other languages has tended to focus on expanded usage of symbol signs, which have the added benefit of being (in general) more glance-recognizable than text legends. How about trilingual yellow plaques on BGSes in the Mexican state of Guanajuato? I recently found some of these on GSV—nowhere near the border. This sign is on US 7 south entering into Williamstown. These are interesting. I am not sure why Chinese is the third language. And at least one of the messages isn't a direct translation anyway. Mex. 51 example: the Chinese is one character away from the word for expressway (高速公路); it is the third character that doesn't match. Gto. 110D example: these are the actual Chinese characters for exit as used in exit tabs on Chinese expressway signs. Mex. 45D: the Chinese characters don't match any of Google Translate's suggestions for airport (the one it drops in the box is 飞机场). I wonder if it is the port (as in harbor) part of the message (on the green part of the sign) being translated since one of the characters (港) matches. It wouldn't be much of an issue if we could finally get away from wordy signs. The Chinese characters used on the signs are actually in Japanese. Though a lot of Chinese characters are shared between the two languages, the vocabulary is a little different between them depending on when the particular word was imported into Japan or China. Thus, 飛機場 (lit. "airplane place") in Chinese versus 空港 (lit. "sky port") in Japanese. Makes me wonder if there is a fair amount of Japanese tourism in that particular area of Mexico. Wow, I thought that was a shield error until I looked it up through SCT. I had no idea before now that that was a state highway, not a federal highway. Many of the street signs around Tehlequah have the Cherokee alphabet as well as the English names. Lafayette, Louisiana has a limited number of American/French street signs. 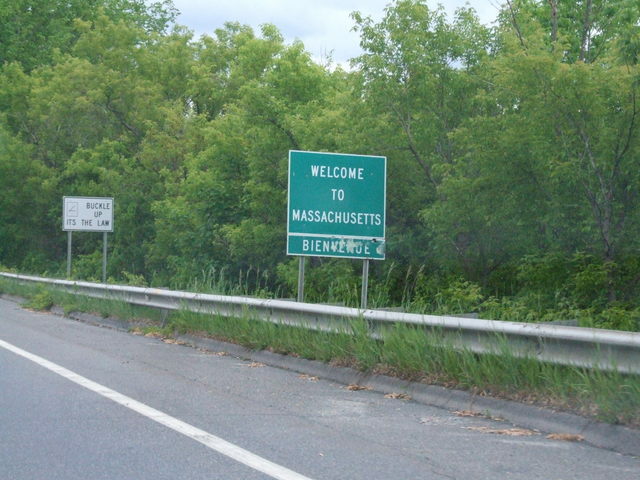 NH welcome signs have "Bienvenue" on them. LA also has the Bienvenue en Louisiane welcome signs. As pointed by luokou the third language is Japanese. They indeed use 高速道路, but only for the Tomei/Shin Tomei and Meishin/Shin Meishin expressways, otherwise they use 自動車道 (literally "motorway"). And while 机场 (機場 in "unsimplified" Chinese, without the 飞/飛) is indeed the most widely used word for "airport" in Chinese, I've also seen 空港 like in Japanese, but it seems that refers to the area around an airport, not the airport itself.